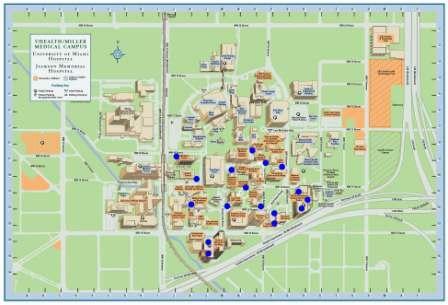 Over 65 blue light telephones are strategically located throughout the Medical Campus. These phones provide a one-touch direct connection to the Medical Campus Public Safety Department and activate a blue strobe light on the unit. Other than in an emergency, the phones may be used to request safety escorts, report suspicious persons or activities, get a jump start for your vehicle, or get help if you are locked out of your vehicle. The phones are not intended for routine information or directions. Click on the Map to view/ download/ print a high-resolution file.